The first big event of 2014 occurred when the well was dug in March. In prior years, we depended on water hauled to the garden from the creek. This approach wasn’t feasible for many reasons including food and volunteer safety so a well was needed. A special thanks goes to Clinton Zettle and the Elliot family. 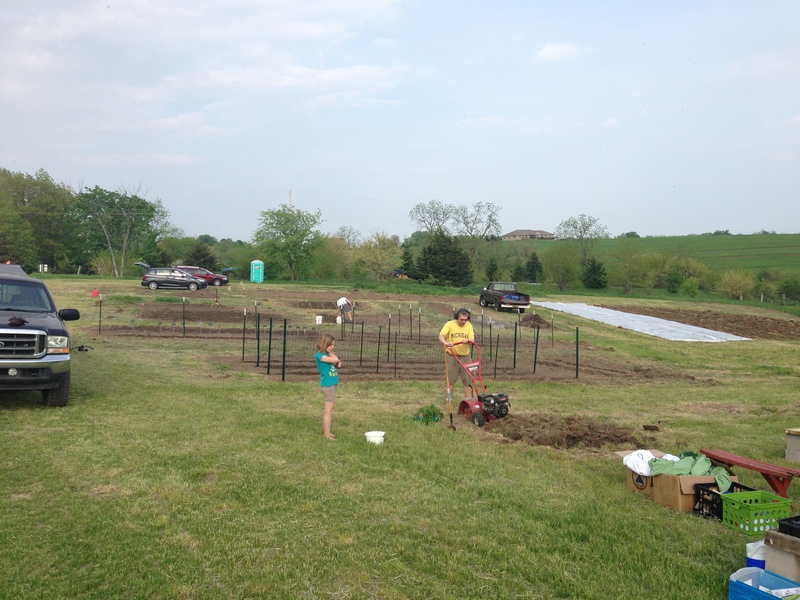 With the help of their horses and mules, we were able to enlarge the garden plots. 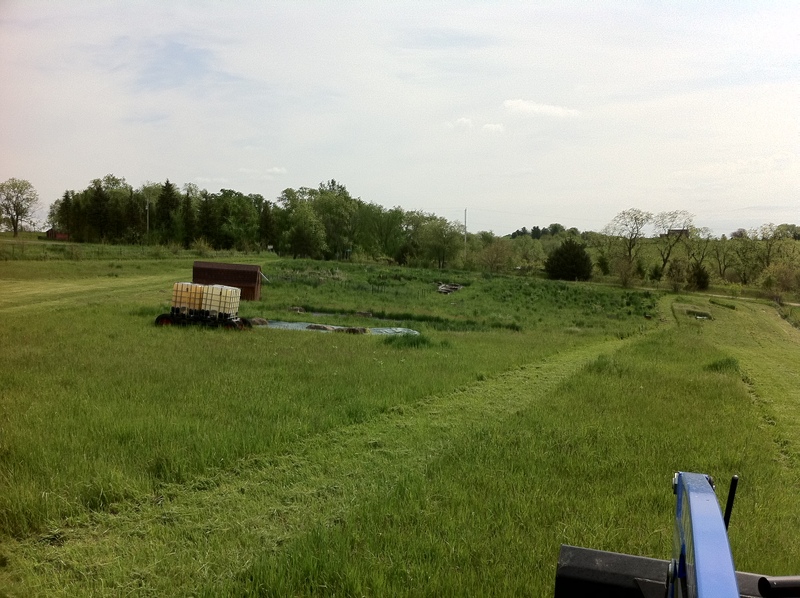 Plowing the new plots and enlarging the ones we already had, contributed to greater production and easier maintenance. It also enabled us to install the drip irrigation system much more conveniently. 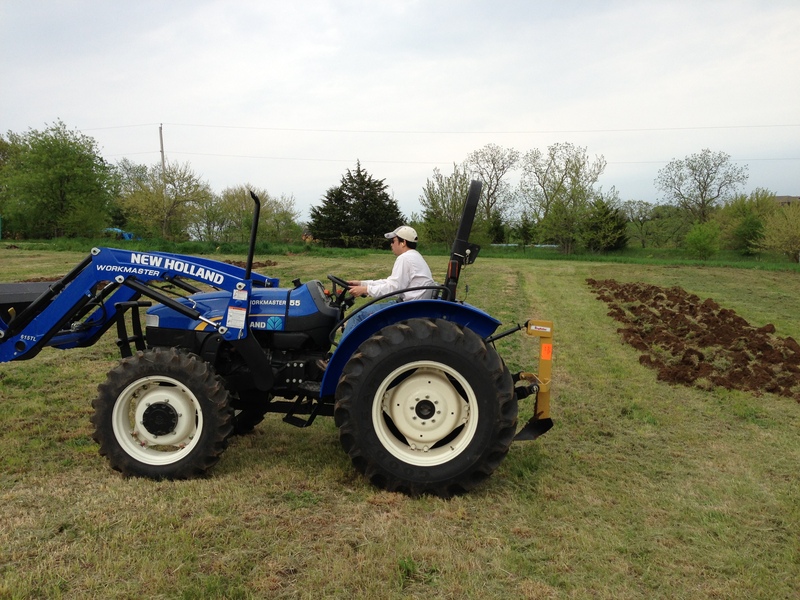 In May, we purchased a tractor-mounted rotary tiller to make soil tilling possible at the larger scale. We couldn’t have prepared the new plots without the help of this amazing implement. Our grant proposal to the FruitGuys Community Fund was accepted in late April allowing us to proceed with the installation of a drip irrigation system. 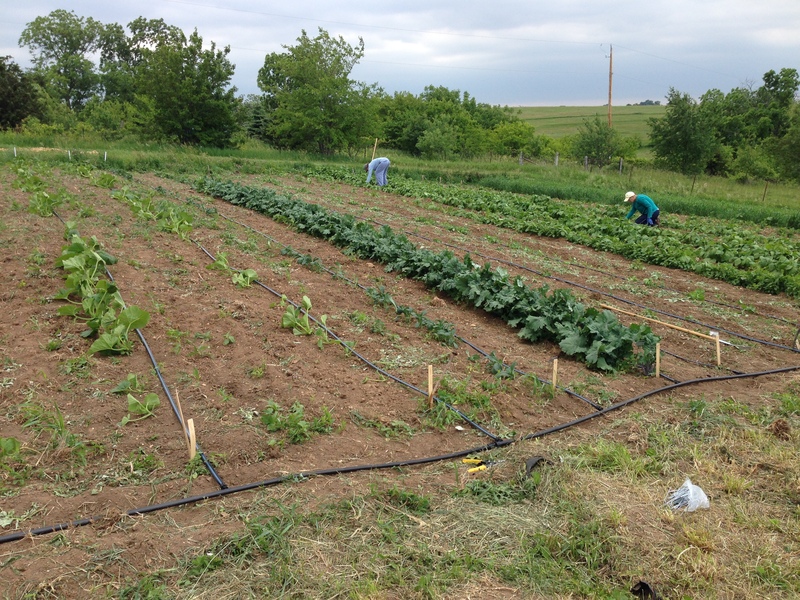 The drip irrigation system was installed in early June 2014 into all 5 of our garden plots. 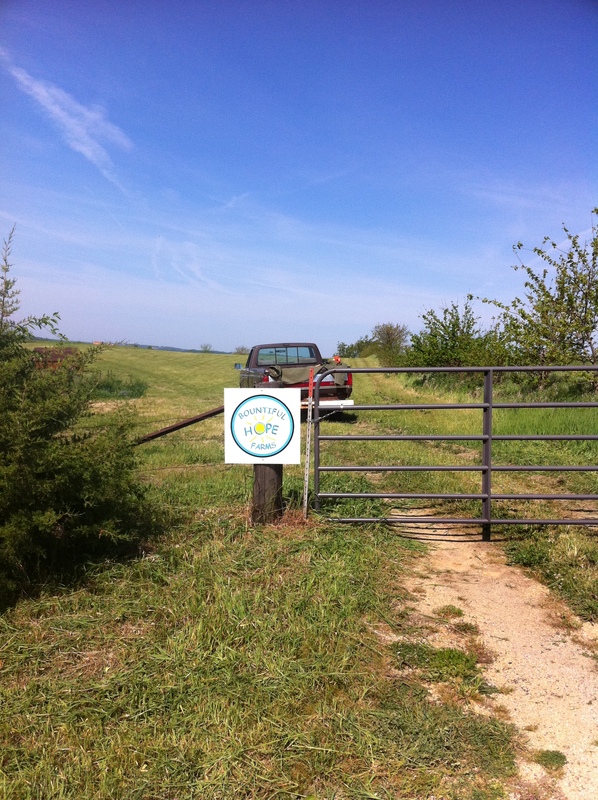 We purchased the equipment from irrigation suppliers found online. As expected, the impact of the drip irrigation system has been profound. It allowed us to expand the size of the garden and deliver high quality produce to our client food pantries throughout the region consistently throughout the growing season. We were able to utilize our labor on weeding and harvesting rather than manual watering efforts. In previous years, our labor efforts were taken up with watering at the expense of other garden chores that left the garden neglected. While we experienced a very wet June 2014, rainfall was only sporadic during July and August. Without the drip irrigation system keeping our crops watered regularly, garden production would have tapered off dramatically and the more sensitive crops would have failed. In order to allow us to use this investment year after year, we pulled the drip irrigation system out of the garden and placed it safely in winter storage. This allows us to use the same equipment again year after year. The drip irrigation system is in perfect working condition and will be reused again next year. We are already planning the 2015 garden and intend to expand once again now that the irrigation system is taken care of. With the help of the FruitGuys Community Fund, we were able to continue to improve the Hoop House and make it a more integral part of produce production. Utilized our own compost at no additional cost. Installed 5 cold frames that measure 4’ by 8’ to give us another time-tested and sustainable fall/winter/spring garden option. Installed a walk-in cooler/germination chamber/heated room which is used to cool and store produce in the summer, used to keep the winter squash safe from frost in the fall and used as a germination chamber for starting seedlings in the spring. This multipurpose space is very energy efficient and costs approximately $1/day. Planted several varieties of produce in late summer within the cold frames and hoop house raised beds to learn what plants are able to sustain themselves in sub-zero temperatures. Also, to learn which provided the best protection for plants in freezing temps. Planted carrots, onions, kale, beets, rutabaga, minutina, arugala, spinach, mache, and swiss chard. So far, we are able to harvest something from all types of plants, but have found that some are of better quality than others. 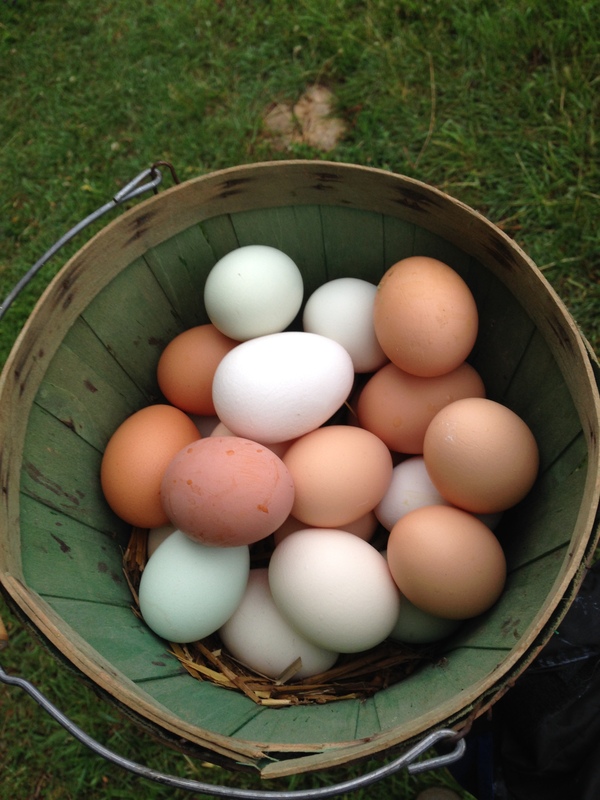 8,929 pounds of produce and eggs donated up from the previous high of 3,200 pounds. This exceeded our wildest expectations and haves us at the nudge we need to keep producing at these high levels for years to come. What a motivating year! !